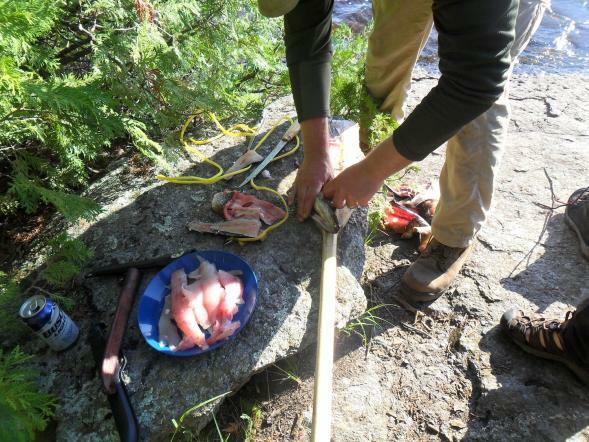 This is the ninth post in a series about hunting for food -- truly meeting your meat. Also check out the earlier posts from the series: Squirrel Hunting with Mom, Duck Hunting, An Unsuccessful Pheasant Hunt, Mom Bags Her First Deer, Ice Fishing, Making Your Own Sausages, Wild Game Charcuterie, Foraging, and Bowfishing for Carp. I spend a lot of time out in the woods hunting and fishing. Most of that time is spent close to home, but occasionally I get the opportunity to plan a trip somewhere else. 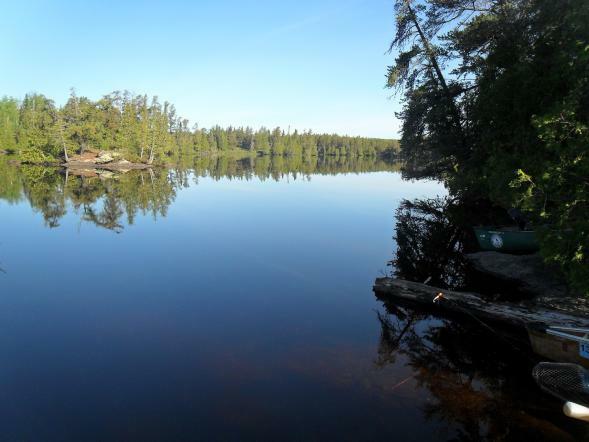 For several years now, my brother has been going into the Boundary Water Canoe Area in northern Minnesota and I have been fortunate enough to go with him on three of the trips. The trip into the Boundary Waters is one of my favorites – it isn't often you get the opportunity to travel out of cell phone range and truly get out into nature. Getting out in the wilderness also gives me a chance to test my cooking skills in a very primitive setting, over an open fire. In the past we have gone with groups of 4-8 people and have had a great time. We have never really gotten into the fish, where we were catching them left and right, but we always managed to catch enough for dinner and have occasionally caught some nice sized fish. This year we took 6 guys into the BWCA at the Kiwishiwi lake entry point and made a beautiful trip up the Kiwishiwi River until we reached our destination on Lake Polly. The trip involved four portages, one of which was 189 rods (1 rod =16 feet) or just about 0.6 miles. Most of this area had been part of a fire and was completely burned out but still very beautiful. All of the spring growth was coming through and made for a very interesting landscape of burned trees and bright green ground covering. We made it to our camp on the northern part of Lake Polly and set up our campsite. Most of us are hammock campers and have some fairly elaborate hammocks to keep us dry and bug free. On our first night we decided to pack in hotdogs because they would be a quick and easy meal for all six guys. A few of the guys have small jetboil burners to cook their dehydrated meals, but most of our meals – breakfast and dinner – were prepared by me and I like to use cast iron. It isn't the lightest camping gear but when cooking over an open fire in the middle of the woods, I have found that I can cook almost anything using a large cast iron skillet and a cast iron Dutch oven. On our first morning at the campsite, we were all itching to get out and get some fishing done. For breakfast we brought in some venison chorizo and made chorizo and egg breakfast burritos. There is nothing like a nice hearty breakfast before setting out for the day. After a brief meeting to plan out where we were all going to fish and what time we would like to meet up for dinner we all set out for the day. We had decided that we were only going to catch and release all the fish we caught because we were planning on have steak for dinner and wouldn't need any fish. 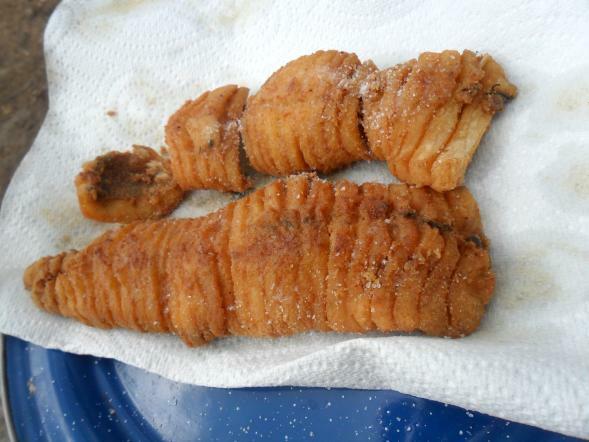 My brother did keep a couple of small mouth bass to eat for lunch, but that was all we kept our first day. 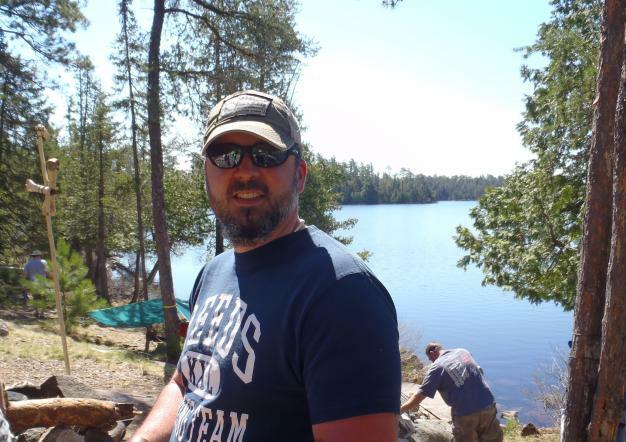 My canoeing partner for this trip was a good friend of mine, Rick Edwards. Rick and I were in the National Guard together and he is the godfather to my daughter, so we get along great. It is important when spending a week away from civilization in a canoe to have the right partner. Otherwise the experience can get frustrating in a hurry. Right away that morning Rick started catching Northern Pike in a shallow area of the lake covered in lily pads. They weren't enormous but were just about the right size to eat. Unfortunately we didn't need any for dinner that night so we tossed them back in the lake. We fished for most of the day and returned to camp around 6:00 pm. My brother is getting married in a couple of weeks, so this trip was kind of like his bachelor party; I wanted each evening meal to be special so I planned a menu for the whole week of things I thought he might enjoy. 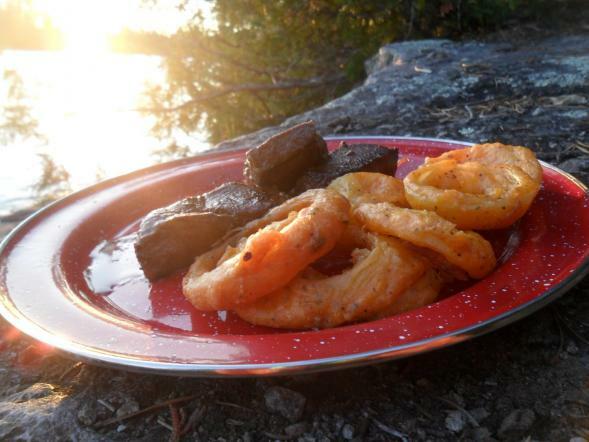 That night I had packed in some venison steaks from last year’s deer and made venison steaks and onion rings for dinner. I made too much batter for the onion rings and didn't want it to go to waste so when I checked the cooler and saw we had some hotdogs leftover I figured everyone would enjoy a corn dog for dessert. It was a great meal to end our first full day in camp. Tuesday morning we got up and made bacon and pancakes for breakfast then set out to do some fishing. I told everyone that we needed 5-6 fish for dinner that night; I was planning a fish curry with tropical fried rice. Rick and I set out for a spot on the lake we hadn't fished the day before. Rick got one small northern and I caught the smallest northern I have ever seen. It was about 5 inches long and no bigger than a cigar. It hit my lure about ten feet away from the boat and felt like a good strike so when I set the hook the fish and the lure came flying out of the water and landed in the canoe. Rick and I stopped at a small island and had lunch and then decided to head out to the spot where we had success the day before. We needed to start putting some fish in the boat for dinner or we weren't going to have much of a fish curry. When we got back to our lily pad spot, Rick got a nice northern right away and then got a couple of smaller northern. As we drifted in the wind I got the first walleye of the trip and another small northern. We moved around the lake to a small bay that had a river running into it and started getting some smaller bass and northern. Rick got a very nice 19-20 inch walleye that was perfect eating size. We decided that we had enough and headed back to camp. When we got back we learned that my brother had gotten a couple of small mouth bass and a small northern, and James and Jeff who were off fishing a small pond had caught some northern but didn't want to portage them back so they released them. We had plenty of fish to make our fish curry that night. The next morning James and Jeff decided to head out early as they had to be back to Grand Forks, ND by Thursday. I tried to get them breakfast before they left but they were in a hurry to get going and couldn't wait for cheesy grits with eggs and sausage. James was also a bit under the weather that morning after trying to finish all of his vodka the night before. After James and Jeff left, we headed out to find some fish and had another successful day, landing a couple of walleyes and a smaller northern. I had wanted to get a smaller northern to try a new technique for filleting it. Northern are very boney and many people don't like to eat them because of this. With bigger northern you can fillet around the bones and do a pretty good job of getting bone free fillets, but with smaller northern this isn't as easy. I wanted to try scoring the fillets to see if that would help with the bones. Scoring is a common technique used for carp but I have never tried it on a northern. What you have to do is scale the fish, then cut the fillets off each side; after this is done you make cuts down the fillet about a quarter inch apart, which allows the oil to get in between the meat and softens the bones, making them disintegrate into the fillet. This technique worked very well, as we didn't have any bones to contend with in the northern fillets. After dinner that night we sat up for a while and it started raining, I went to bed around 10:00 pm but had a hard time sleeping because of all the lightning and thunder that went on all night. It rained for 10 hours straight and the thunder was so loud that it shook the earth. When it finally cleared off the next morning we got out Rick's hand cranked radio and listened to the weather report. The radio said we could expect three more days of high winds and thunderstorms. We discussed staying, but in the end it didn't make much sense for us to stay just so we could lie in our hammocks. We packed up and headed out that afternoon. On our way in there were 4 portages but on the way out we had gotten so much rain over night that the third portage disappeared and we were able to canoe right through it. All in all it was a great trip that got cut short because of bad weather. We had some good fishing, great conversations, and a damn good fish curry. 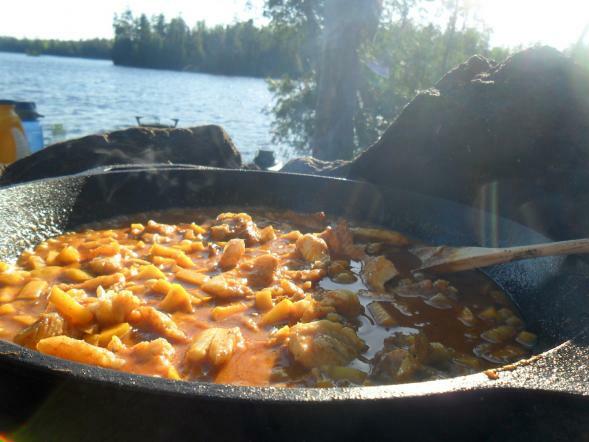 Every time I go into the Boundary Waters, I like to try a new dish that you wouldn't typically identify as camping food. The last time I went, I made a very nice fish risotto with a grilled lake trout, and the time before that I made a pretty decent parmesan crusted trout. 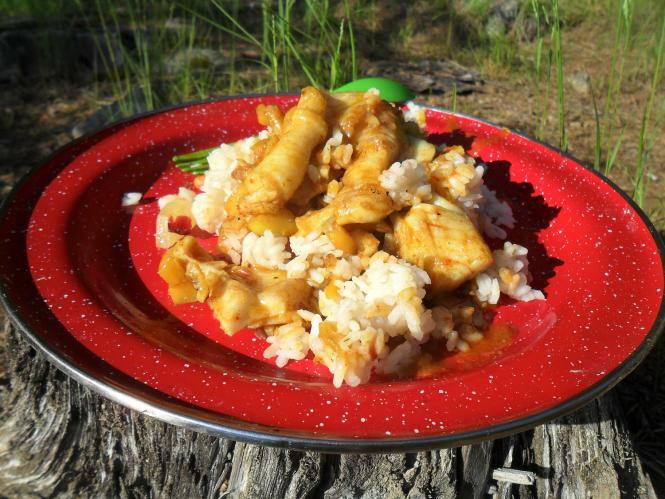 Here is my boundary waters version of fish curry with tropical rice, adapted from Eric Ripert. Bring the water and rice to a boil and then move off direct heat, cover and allow to simmer for about 15 minutes. Add the tropical fruit trail mix and stir to incorporate, let simmer for 5 more minutes then remove from heat and stir in the raisins. Over medium high heat add 2 tablespoons canola oil and pan sear the fish fillets for 2 minutes on each side and then set aside. In the same pan add 2 more tablespoons canola oil and then sauté the shallots, garlic, ginger, apples and lemon grass for about 3-4 minutes. Add the curry paste, coconut milk, curry powder and chicken stock and let simmer for 10-15 minutes until the curry sauce starts to thicken up a little. Place the fish fillets in the sauce and cook for 5 minutes at a simmer. Spoon the curry and fish mixture over some rice and serve. Jamie Carlson lives in Burnsville, MN with his wife, Amanda, and their two kids Eleanor and Charlie. He works as an Rn at the Minneapolis VA hospital. He enjoys hunting, fishing, foraging, and, of course, cooking. He believes that all food can be tasty if it is prepared with care, and he writes about his adventures cooking everything from Pickled Venison Heart to Roasted Dove on his food blog, You Have to Cook it Right. Follow him at @youcookitright. His last post for SGT was Bowfishing for Carp.